As the days get shorter, we wanted to shed a little light on a customer who wanted to share why they love Blue Ridge Biofuels and biodiesel. We are a family ­owned residential and light commercial solar installation company focusing on sustainable idealism, a personal customer experience, and an unwavering commitment to quality workmanship. 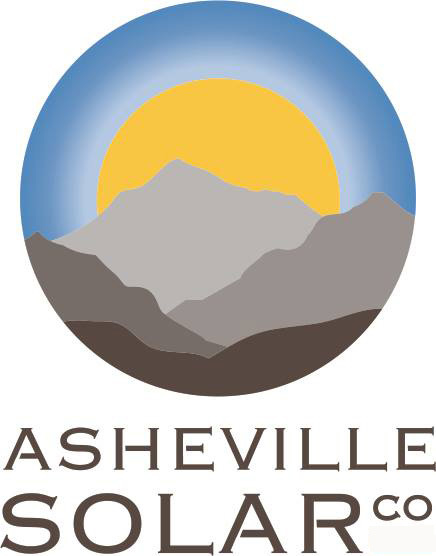 Our mission is to be Asheville's affordable and accessible answer to sustainable energy by using a holistic approach to energy efficiency and production. How does your company use biodiesel and what type of equipment do you have? 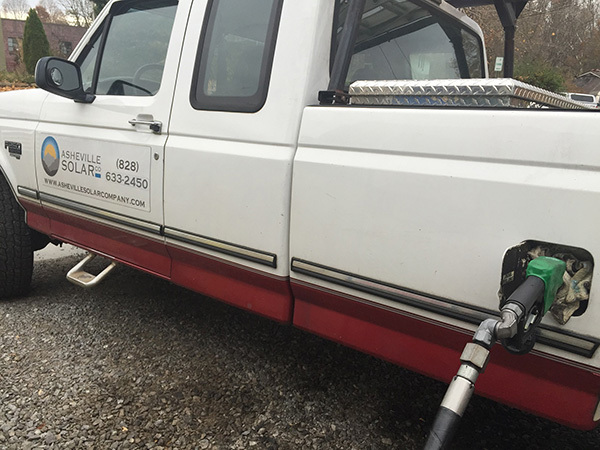 We use biodiesel to power our main installation vehicle, a 1997 Ford F-250 diesel. 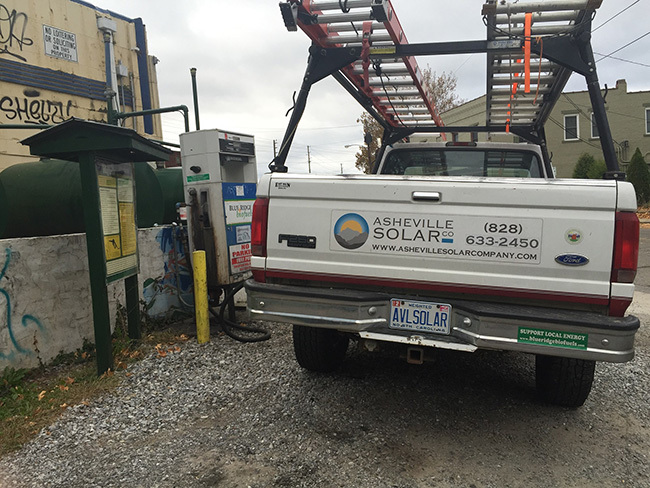 We attempt to only use biodiesel for the trucks fuel, B-99 when it's available. How does biodiesel fit into your business – why do you use biodiesel? Biodiesel fits into our business and life philosophy of attempting to reduce our negative impact on the planet. What benefits of biodiesel are most important to you as a business? Biodiesel helps us maintain a "close-loop" for our operations. Meaning, we attempt to be conscious about the choices we make (recycling, food, fuel), the materials we use (American made when possible to reduce the production impact) and of course what we do for a living. Biodiesel, especially B-99 helps us reduce our reliance on fossil fuels and helps us maintain our holistic approach to energy efficiency and production. We strive to do more than just install solar, we attempt to have an impact on our whole way of operating. What benefits are most important to your customers? How do you use biodiesel as a marketing tool? Most of our clientele have made the decision to add a solar system to their home or business as an effort to reduce their impact on our planet. We are proud to say we use a renewable fuel source for our main installation vehicle. What sets you apart and makes your business unique so that biodiesel customers should patron your business? The fact that we are a family owned and operated company and that we only focus on residential and light-commercial (small businesses) customers. Asheville is our home and we love it hear and the people and small businesses. We chose to only operate in these sectors because we prefer to deal with homeowners and business owners that are a part of the Asheville community. Do you have a message for potential biodiesel customers like yourselves? Don't believe all the rumors you hear about biodiesel. Misinformation and education is one of the biggest hurdles for both the biodiesel and solar industry. We have been running it in our truck trouble free. Our truck runs great on it and it smells o-so-good. How has it been working with Blue Ridge Biofuels? Every time I see one of the crew members filling up the pump stations they are always very friendly and you can tell they enjoy what they are doing. Why do you think people use biodiesel and support BRB? They have turned off their blinders and look up while they walk. They aren't stuck behind a screen while they are in public. They appreciate the beauty of where we live and want to do what they can to help keep it this way for future generations to enjoy. Do you use biodiesel in your personal vehicle or recycle your used cooking oil? The truck is my personal vehicle and company vehicle. We need more pumps…and more B-99. …We hear ya, Nate. We want more pumps and are working with our partners to make more pumps available. Thanks so much to Nate for taking the time to answer our questions and talk a little bit about biodiesel. 1 Comment on "Customer Spotlight: Asheville Solar Company"
You guys are awesome. I wish I needed diesel, and I wish I lived in Asheville so I could get it from you. I'm proud of what you are doing, and happy to see you are still growing. Congratulations.